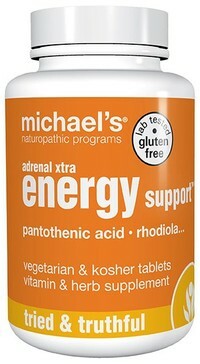 Adrenal Xtra Energy Support™, 60 vegetarian tablets (Michael's Naturopathic) - Penn Herb Co. Ltd.
Adrenal Xtra Energy Support™ contains high amounts of pantothenic acid with extract and whole herb Rhodiola rosea to provide support for combating fatigue and enhancing both physical and mental stamina. Vitamin C – concentrated in the adrenal glands. It is needed for the production of cortisol. Athlete's and active people's energy support; support for combating fatigue and enhancing both physical and mental stamina. As a dietary supplement, take 3 tablets with breakfast or, for optimal results, take 1 tablet with each meal. Dosage may be increased as directed by a healthcare practitioner.